I am going to have to dub the summer of 2016 the summer of pesto. I found and adapted a new 5 pesto recipe that I love, I’ve spread pesto on crostini, tossed it in my pasta, eaten it straight from the jar and now on this cauliflower pizza crust. Oh, wait should that be non-gluten cauliflower pizza crust? I get so confused, but no matter its name, this crust is absolutely fabulous…delicious…and easy. My inspiration is from this recipe. But there is a warning, YOU MUST LET THE CAULIFLOWER COOL BEFORE YOU WRING IT OUT! Please trust me on this one. This is experience talking. This cauliflower pizza crust is so very versatile. 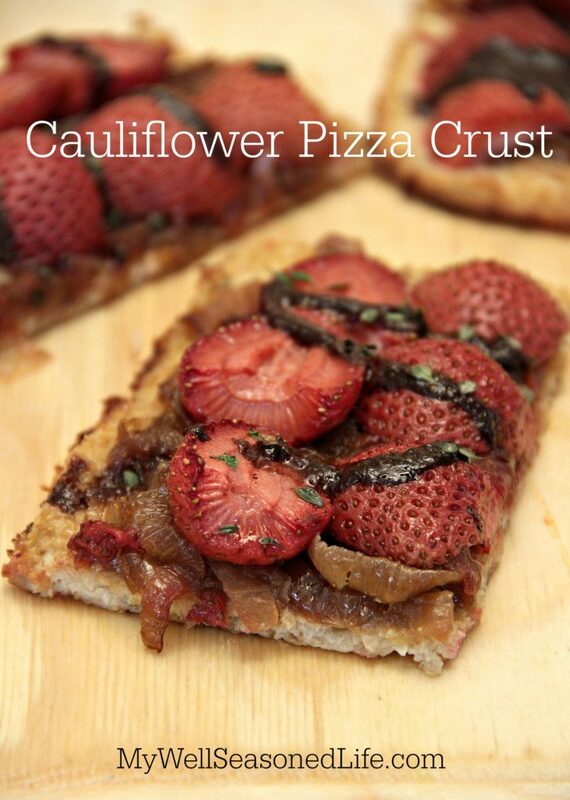 I pre-baked the crust, then spread caramelized onions and strawberries on top threw it in the oven for 10 minutes and then drizzled reduced balsamic for a sweet appetizer. 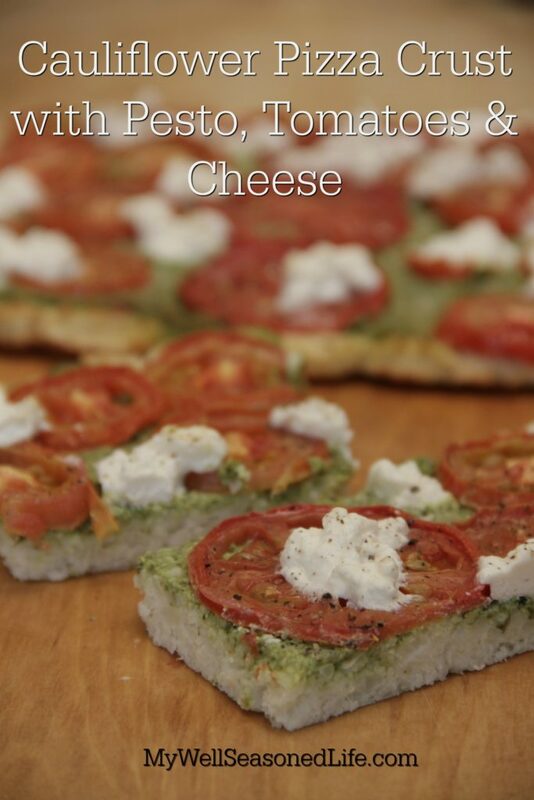 But the all time favorite is cauliflower crust with pesto, tomatoes and cheese of your choice. I used ricotta. Here’s a short video to show you how it’s done. The recipe follows. Enjoy. Place florets in food processor and pulse until grainy but not pureed. Repeat until all cauliflower is done. Fill a pot large enough to hold the cauliflower with water, add salt then cauliflower grain. Cook for 2 minutes. Line colander with a kitchen towel. Carefully pour cooked cauliflower into colander. Allow to cool. PLEASE ALLOW TO COOL. THIS IS EXPERIENCE TALKING. Once cauliflower is completely cooled wring the water out of the cauliflower. It will become a softball sized clump. Crack an egg in a medium sized bowl, whisk. Spread cheese of choice on top of tomatoes. Sprinkle with salt and pepper. This is brilliant. I’ve never thought to use cauliflower as flour, but now it’s so obvious. Thanks for sharing. I can’t wait to try this recipe. I’m hooked on this cauliflower crust. Thanks so much for stopping by Mette. This has been on my to-do list way too long. You make it looks so easy and irresistible. Adding the strawberries with caramelized onions & balsamic glaze looks amazing. I am so excited to try this.